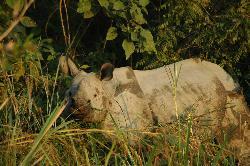 Overview map of Chitwan National Park. 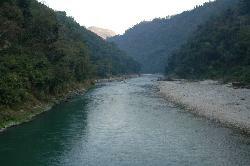 Route from Kathmandu to Pokhara; from there kayaking on the Seti river and via Baratpur to Chitwan National Park. 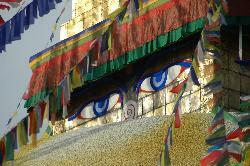 Eyes on the Boudha stupa watch in all four directions. 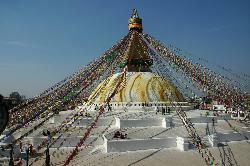 Holy stupa in Boudha has attracted many Tibetan and Sherpa people to settle around it. 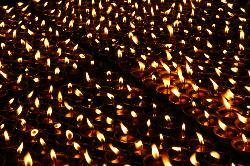 In the evening butter lamps create a solumn atmosphere. 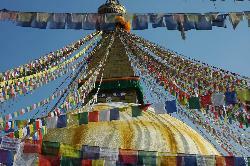 An hour's walk from Boudha lies a very holy place for Hindus; called Pashupatinath. 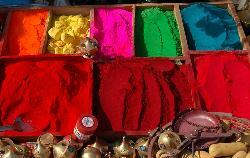 Coloured powder and other stuff for pilgrims. 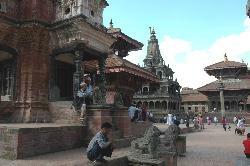 The smallest but very picturesque of the three kingdoms in the valley; Patan. Sitting in Patan's durbar square. 360 panorama of Durbar Square in Patan. 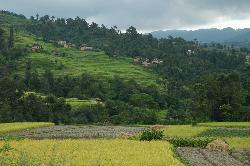 At the edge of the valley the city seems far away; traditional Newari houses and rice terraces are a good place for those seeking a rest from Kathmandu. 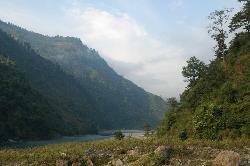 Sankhu features a pleasant village and gentle hills for a good walk. 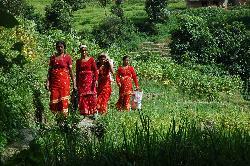 Women in traditional red dresses on the way to Sankhu. 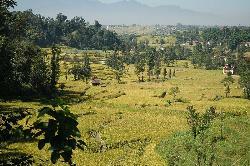 Small trails lead through the millet and rice. In fall 2005 the conflict between Maoists and government forces was still in full swing; hopefully 2006 will end with Nepal coming to rest. 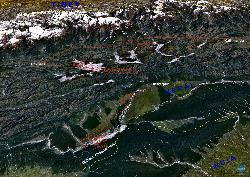 We take a 45 minute flight from Kathmandu to Pokhara; from Annapurna to Manaslu the range of snow appears in the north. 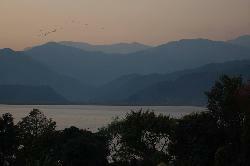 Pokhara is a quiet place; and the still Phewa lake adds to this. 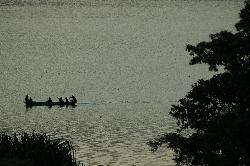 Locals on the boat visit the holy shrine in the middle of the lake. 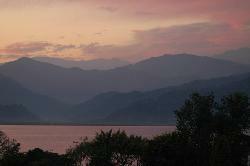 Sunset turns the clouds and the lake in a pink light. 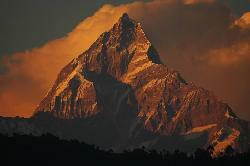 Machupuchare; Fish Tail mountain; catches the last rays of the setting sun. 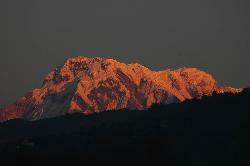 The last sun on the mountain. 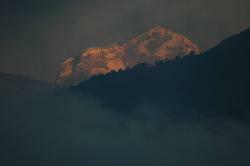 Mist on the lake and the illuminated peak of Dhaulagiri (8'167 m). 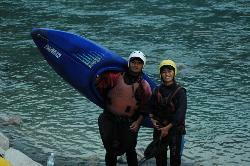 Starting our kayak experience on the Seti river; Sonam getting ready. 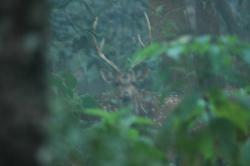 Thanks to experienced guides Laxman and Mahindra we were well prepared. 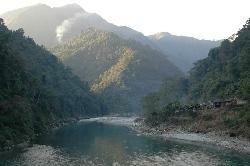 A long second day where we arrive shortly before dusk and are very tired from 6 hours on the river and a number of rapids class 2 and 3. 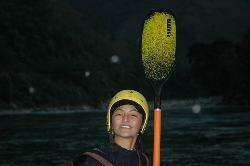 Sonam showed enormous courage; went down a big rapid and flipped twice. 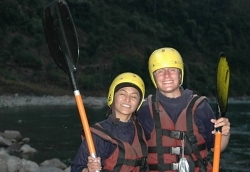 To the guides' knowledge; she is the first local woman to ever kayak a river in Nepal. The Seti is one of the warmest rivers in Nepal; even in the middle of December it's not too freezing if you flip in the rapids. There are some level 2 and 3 rapids; but there are also very gentle parts where we slowly paddel through narrow gorges; watch monkeys on sheer walls; and beautiful kingfisher birds on moss-covered stones. 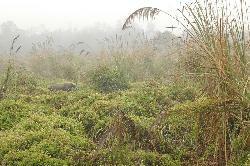 The area is very remote; we pass only few villages and stay in Keragari where we sleep in a simple hut and enjoy a fine dal baht (rice and lentils) village-style. 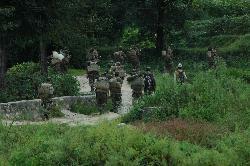 The largest village Keragari;surprisingly there are no Maoists hiding in the valley. Mahindra; Sonam and Laxman enjoying a hot tea in the village. Local cuisine again; after a fantastic pea soup for breakfast we're ready for the last part on the river. Once the fog has burned off the temperatures are very pleasant. 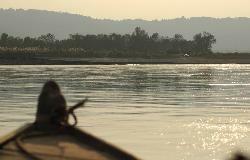 We stop near the highway to Chitwan; take out the kayaks and say good-bye. It was a bigger adventure than we expected; but are happy to have done it. Compliments to Mahindra and Laxman for a trip that we started with some reservations but enjoyed thoroughly and which was one of the highlightes of our journey. After catching a public bus to Bharatpur we are picked up and cross the Narayan river on the way to our lodge "Temple Tiger". 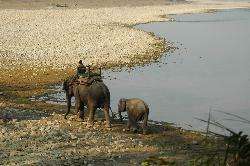 We picked one of the expensive lodges that is located within the park; on the other side of the river. 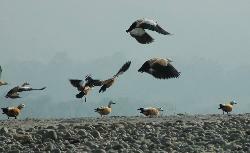 Along the river are the picturesque hamlets of the native inhabitants; called Tharu. 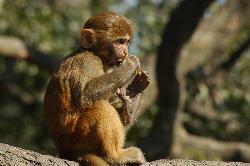 ... but then; making friends with our carrier. 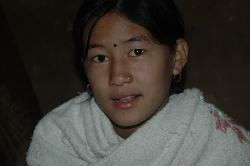 After spending the nights on floor-boards in the Seti valley we enjoy the comfortable beds. After a late breakfast we are dropped off near the river and take a boat ride. 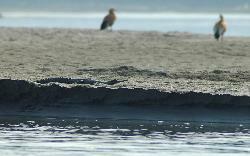 From the boat we see the wildlife at the national park's boundary; here a rare Gharial crocodile is resting on the bank. 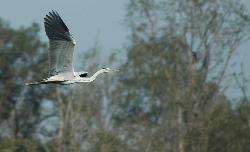 Migratory birds from Central Asia and Russia spend winter in Nepal. 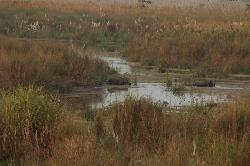 From the lodge's balcony we enjoy great views over the marshland. Birdlover's paradise; especially the smaller birds feature stunning colours. 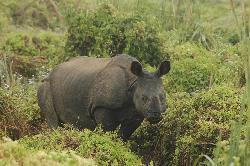 At dusk a rhino with her baby wades through the shallow creek. 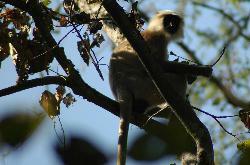 Langur monkey sitting in the trees. 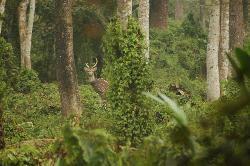 ... while spotted deer warn them about dangers on the ground. 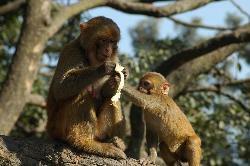 Monkey family enjoying a banana. 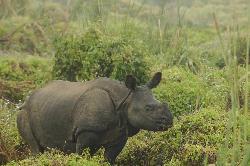 After a long day on elephant's back we finally see the rare rhino (Rhinoceros unicornis); the entire population is estimated to be at 2'000. 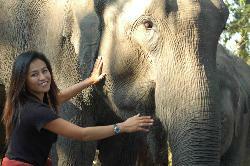 They are quite tame; after a short glance at our elephant the rhino ignores us. 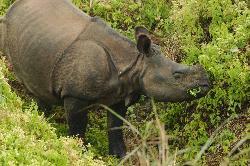 The "greater one-horned rhino"; one of 600 in the national park. They need water and green grass all year round. 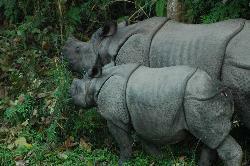 Female rhino with her baby; this is the moment where they get aggressive easily. 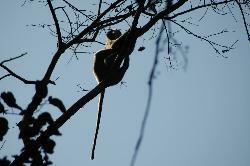 As the sun sets; the elephant driver spots a male at the edge of the dense forest. 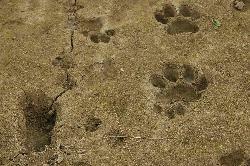 The tiger is the king of the jungle; we only see its' huge footprints in the sand. It is huge compared to the human foot next to it; and not surprising that a tiger easily killed three people in the last two months. 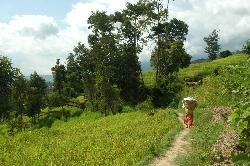 Back in Kathmandu we leave in the afternoon for Nagarkot; a viewpoint above the valley. 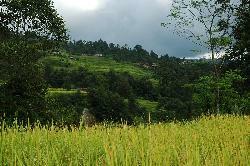 We pass the rice fields near Baktapur on the way to Nagarkot. 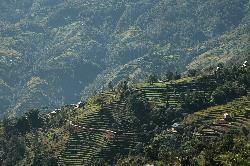 Rice terraces crawl up the hillsides as far as the eye can see. 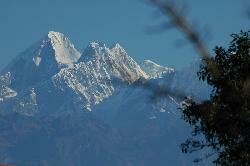 Himalayan giants in the north. 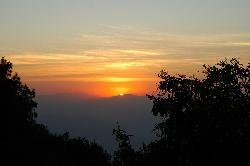 Nagarkot is famous for its sunsets; and does not disappoint us. 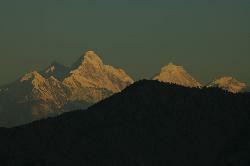 Last rays of the sun before it sets behind the Siwali range. 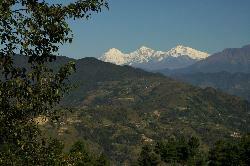 Panorama of Himalayan range from Nagarkot at sunset. The last light turns the snow pink. 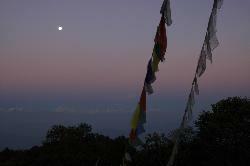 Moon rising over the Himalayas. 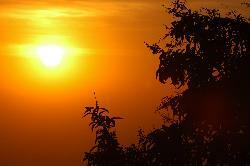 We rise early to witness the awakening of the peaks; within minutes they rise from the shade; turn orange and then white. 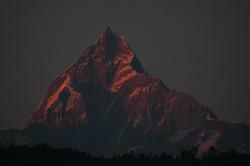 The peak in the middle is Manaslu; a great trekking area which doesn't get many trekkers.